As a Celtics fan, it’s strange going into the NBA playoffs without a horse in the race. Since the 2007-08 season, the C’s had been a legitimate championship contender, but that changed last summer with the departures of Kevin Garnett, Paul Pierce, and Doc Rivers. The trades that Danny Ainge made sending those guys out of town have helped build the Celtics for the years going forward, but left them as out of the tournament and in the draft lottery in the meantime. I’m not the biggest NBA fan and I’ve been much more excited about the NHL all year, but there are still plenty of narratives to be excited about during the 2014 playoff tournament. As one of the most successful franchises in all of professional sports, and one of the model franchises in the game of basketball along with the Lakers and Spurs, there are plenty of Celtics alumni in key positions around the NBA. The C’s are an organization that takes care of their own, and can get you a good position on another team in you choose to leave. Even though they’re not in it this year, the Celtics’ influence can still be felt on the Association this spring. Larry Bird’s Indiana Pacers. After a one season hiatus, Larry Bird signed back on as Team President of the Indiana Pacers. Last year, Indiana made it to the Eastern Conference Finals before bowing out to the Miami Heat in seven games. Bird’s team has been a model of how to build through the middle and getting a good roster without tanking a season. Paul George has emerged as a star player in this league, and Lance Stephenson and Roy Hibbert are great players when they’re on their game. The Pacers earned the top seed in the East, because they were determined to have the home court advantage in a rematch with Miami. They struggled out of the gate in Game 1 against the Atlanta Hawks, and if they get upset, Bird might find himself wheeling and dealing to retool in a big way this summer. They’ve built high expectations for themselves, and now is the time to deliver. Frank Vogel, the Pacers coach who previously served as an assistant coach for the Celtics from 2001 to 2004, might find himself in the hot seat if the Indiana ends the season anywhere short of the NBA Finals. The state of Indiana has a long and storied tradition with the game of basketball that predates Indiana State hero Larry Bird by decades, but one thing that has evaded them is an NBA Title. Since started working for the team, the Pacers have been arguably the best run and most successful NBA team that has not won a championship. Now is as good a time as any to make that happen. 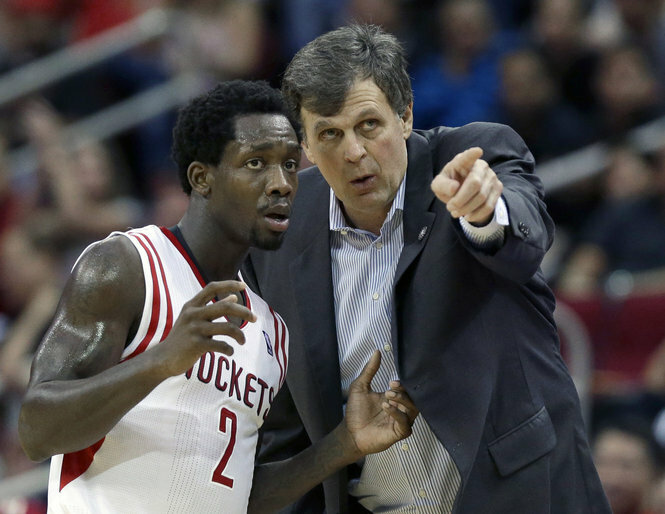 Kevin McHale’s Houston Rockets. McHale did not experience the same level of success as an executive as his former teammates Bird and Ainge, but he is a pretty good coach. His biggest hit when he was running the Minnesota Timberwolves was drafting and developing some high school kid named Kevin Garnett into one of the best players in the history of the NBA. After the Wolves failed to improve after trading KG to the Celtics, McHale got canned and was replaced by Kurt Rambis of all people. Rambis’ failed tenure in Minnesota validated what McHale was able to do, and he’s got the Houston Rockets playing really well now. Rockets GM Daryl Morey, who also has ties to the Celtics organization, made some smart acquisitions trading for James Harden, and bringing in Jeremy Lin and Dwight Howard. This is another example of building without tanking, acquiring assets that can be used to trade for a blue chip player, like the Danny Ainge did to get Ray Allen and Kevin Garnett in 2007, and like he might again this summer if he can pull off a trade for Kevin Love. Houston has their hands full with the Portland Trail Blazers, but they will be contending in the Western Conference for years to come. Doc Rivers’ Los Angeles Clippers. On one hand it was saddening and baffling to see Doc Rivers leave the Celtics last summer, but the other hand, it was the right move for both Doc and the Celtics. Doc did great things in Boston. In 2008, he coached the C’s to their 17th NBA Title, and their first since 1986. He got Boston, and was one of the powerful voices in Boston sports after last year’s Boston Marathon tragedy, but it was time to go in a different direction. Doc is the kind of coach you get for a team that wants to win a championship now, and that wasn’t going to happen in Boston this year. Brad Stevens is the guy who will get the most out of the young roster, while Doc had value for a team like the Clippers, who are already a playoff team, but their star players like Chris Paul and Blake Griffin need guidance in getting to the next level. This year, the Clips had their best regular season in franchise history. That’s not saying much as Doc went from one of the most successful franchises in all of sports to one of the most historically futile, but he does have them in a good position this year. It’s a strange year in the NBA. The Celtics and Lakers are both missing the playoffs for only the second time in NBA history, and the Clippers are the LA team playing meaningful games in April. The Knicks, Sixers, and Pistons are on the outside looking in as well. The status quo has been thrown out this year. No wonder David Stern left when he did. Kevin Garnett’s and Paul Pierce’s Brooklyn Nets. Seeing KG and Pierce in a different uniform hurt even more than seeing Doc coaching the Clippers. Both of these guys will have their numbers (5 and 34) in the rafters of the TD Garden someday, and they are still worth rooting for in the playoffs this year despite playing for a division rival. The draft picks the C’s got back in return for their two aging stars are going to make the Celtics better long after their careers are over, and the Nets will have trouble keeping those picks out of the lottery without KG and Pierce, especially given the injury histories of Deron Williams and Brook Lopez. In the meantime, the Nets have an interesting team that had Miami’s number during the regular season. Rookie head coach Jason Kidd has apparently gotten past his early season blunders and Brooklyn could be a surprise team coming out of the East. Another former Celtic, Jason Collins, the NBA’s first openly gay player, is on the Nets, so that’s another reason to root for Brooklyn if you’re a Celtics fan. The Nets are playing to the Toronto Raptors, who are not accustomed to making that playoffs. KG and Paul Pierce have been in this spot before, although they’re wearing different colors this time around. It feels weird rooting for the Nets and rooting for Jason Kidd, but those guys make it okay. Tom Thibodeau’s Chicago Bulls. Coach Thibs was an assistant coach for the Celtics when they won it all in 2008 and when they made it to a heartbreaking Game 7 against the Lakers in 2010. He’s a defensive genius and was a well respected assistant who never got a head coaching opportunity before the Chicago Bulls came calling. Thibodeau has made the Bulls a consistent contender, even with former MVP point guard Derrick Rose being constantly injured for the last three seasons. While an assistant in Boston, he made the Celtics into the best defensive team in the NBA, and in Chicago, he has made Joakim Noah into the 2014 NBA Defensive player of the year. Thibodeau’s teams have been though a lot, but they never go down without a fight, it seems. They have their hands full with John Wall and the Washington Wizards, but if there’s one thing we’ve come to expect from the Bulls, it’s an honest effort. Rick Carlisle’s Dallas Mavericks. Carlisle was a reserve for the Celtics when they won their 16th NBA Title in 1986. He retired from playing in 1989, and started his coaching career the following season. He was an assistant coach for the Indiana Pacers under Larry Bird, and later became a head coach for the Detroit Pistons, Pacers, and Dallas Mavericks. When he guided the Mavs to their franchise’s first NBA Title in 2011, he became one of just 11 people to win a championship in the NBA as both a player and as a head coach (that list includes Bill Russell, Phil Jackson, Bill Sharman, Tommy Heinsohn, KC Jones, and Pat Riley that I was able to come up with off the top of my head). Carlisle has quietly become one of the best coaches in the NBA, but his year he’s matched up against the very best in the first round. Dallas is back in the playoffs, but they’re up against one of their Texas rivals, Gregg Popovich and the San Antonio Spurs. The series should be a lot tighter than your typical #1 vs. #8 series. Brian Scalabrine’s Golden State Warriors. Scal was a fan favorite when he was in Boston, despite being the last guy on the bench when they won it all in 2008. He’s a real character, and is a much smarter basketball guy than a lot of people give him credit. When his playing career ended, Scalabrine became a team broadcaster for the Celtics, filling in for Tommy Heinsohn as the color commentator on TV during road trips. Last summer, Scal scouted and worked out with Kelly Olynyk before the Celtics drafted him, and was considered as an option to replace Doc Rivers before Ainge eventually hired Brad Stevens away from Butler University. After that, Scal took a job as an assistant coach for the Golden State Warriors, working under Mark Jackson. It was reported a few weeks ago, that Scal was getting reassigned by the Warriors, but the Warriors front office wanted to keep him within the organization. If the Dubs have an early playoff exit, it could be the end for Jackson, and Scalabrine could possibly be their next head coach. The Boston Bruins. Who am I kidding? This is the real answer. If you’re a Celtics fan and you’re wondering what to watch this spring, there is a great hard-nosed hockey team with championship aspirations that plays in the same building as the C’s. In fact, the Bruins own the building and rent it out to the Celtics. They won the President’s Trophy as the best team in the regular season, but have their sights aimed higher than that. Patrice Bergeron should win the Selke Trophy as the NHL’s best defensive forward. Zdeno Chara should win the Norris Trophy as the NHL’s best defenseman. Tuukka Rask should win the Vezina Trophy as the NHL’s best goaltender. What really matters is the Stanley Cup. It’s the best trophy in all of sports, and the Bruins have as good a chance as anyone. They’re playing the Detroit Red Wings in round one, which makes for a classic Original Six match up. There’s nothing better than playoff hockey, and without the Celtics in the NBA playoffs, it’s the only playoffs in town.